Visual acuity testing is limited. As creatures with spherical vision, we not only see what’s straight ahead but also what’s beside us—known as our peripheral vision. And while visual acuity tests our ability to distinguish fine lines of singular objects, visual field testing, or perimetry, takes our entire field of vision into consideration. 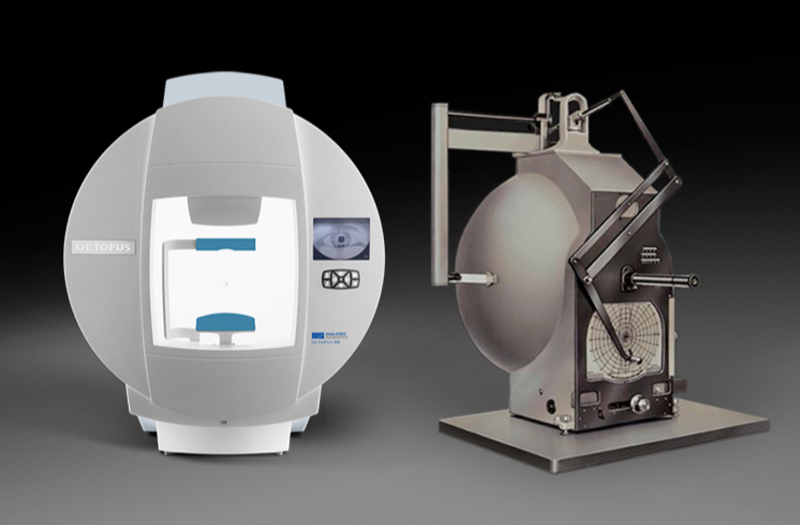 Now, perimetry is most commonly and accurately performed with perimeters, automated equipment that helps determine any deficiencies in patients’ field of vision. Perhaps patients recall sitting in an eye doctor’s office, looking inside an instrument at a screen. While focusing his or her eyes on a target straight ahead, lights flash in different locations at varying levels of brightness. Whenever the patient sees this flash of light, he or she presses a button on a remote. Throughout the exam, a computer records the location and timing of each flash and the patient’s corresponding—or lack of—response. Once the test is complete, a printout expresses any problematic areas of vision loss, where the patient did not see a flash of light. Additionally, perimetry testing can help monitor vision after diagnosis to ensure glaucoma treatment is effective in preventing further vision loss. More vision loss means optic nerve damage. The concept of testing the entire visual field dates back as far as the fifth century, when Hippocrates first described hemianopia, also known as blindness over half of the visual field. In 150 BC, Ptolemy described our field of vision as circular—many years before Hans Goldmann developed the hemispherical bowl perimeter in 1945. It was Franz Frankhouser and his peers, however, who created the Octopus, the first automated perimeter—which made way for automated testing practices used today in perimetry. Perimetry tests a patient’s entire scope of vision, essentially detecting any issues in both central and peripheral vision. 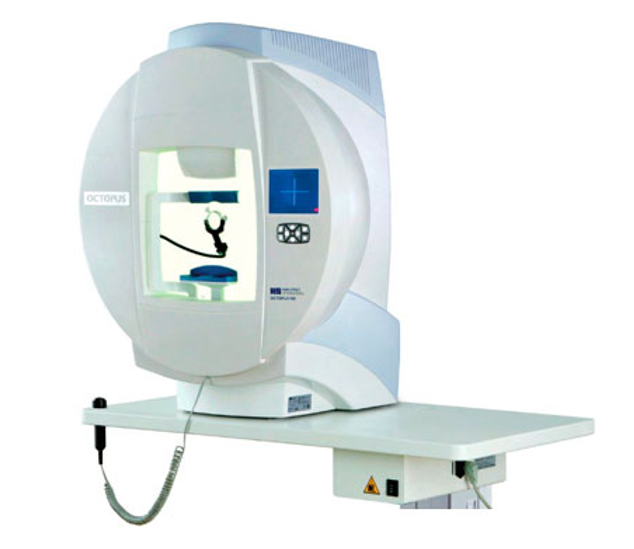 This method of visual field testing brings an object into a patient’s view using steady, horizontal motion. The stimuli moves from a blind area in the patient’s field of vision (typically the back of the head) until the patient says he or she can see the object. The location at which the patient first sees the stimuli is recorded. Think of this as the moving test target method. With static perimetry, stimuli appear in different locations within the visual field. The patient signals each time he or she identifies the stimuli within his or her field of vision. Think of this as the stationary test target method. 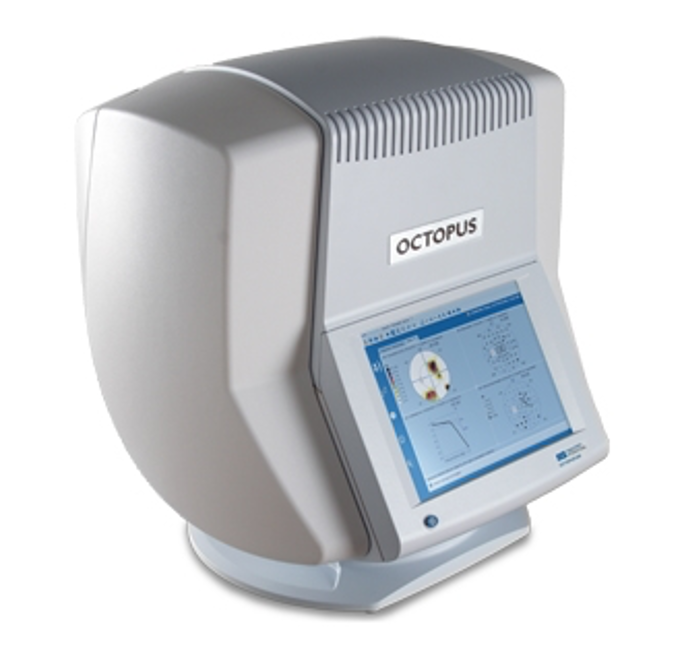 The Haag Streit Octopus 600 perimeter features new Pulsar early detection and standard white-on-white perimetry, with LED technology and touch screen. 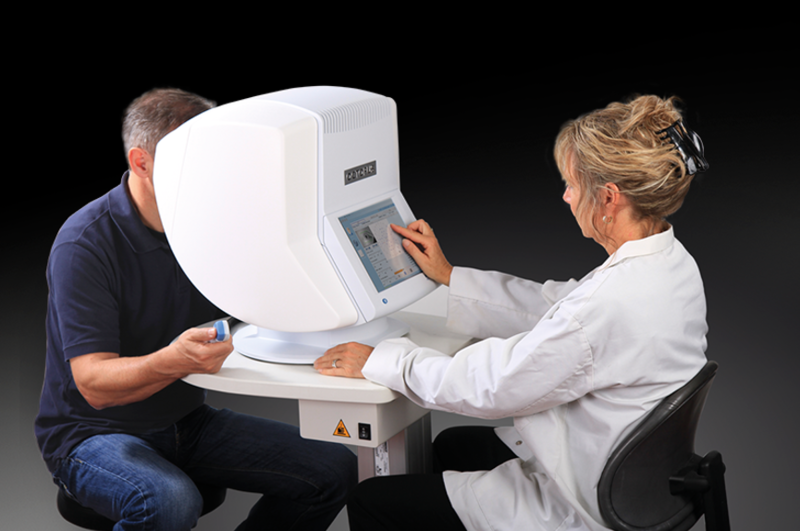 This instrument is compact sized with simplified perimetry and improved EyeSuite software to streamline operation and provide a range of visual field analyzing. The Octopus 900 Basic represents the most complete 90-degree, full-field projection perimeter available today. It allows for testing in all levels of disease including early detection, tracking progression or performing the most sensitive examinations at the end stage of disease. Easily upgrades to any feature in the PRO Model via the entering of a code. The Haag-Streit Octopus 900 Pro perimeter is the most versatile 90-degree, full-field projection perimeter on the market without limitation—for private practice, clinics, teaching institutions and scientific applications. It allows for testing in all levels of disease—whether you’re looking for early detection, tracking progression or performing the most sensitive examinations at the end stage of disease. The Canon PTS 1000 Automated Perimeter is a modern diagnostic instrument for precise and fast testing for field of vision. 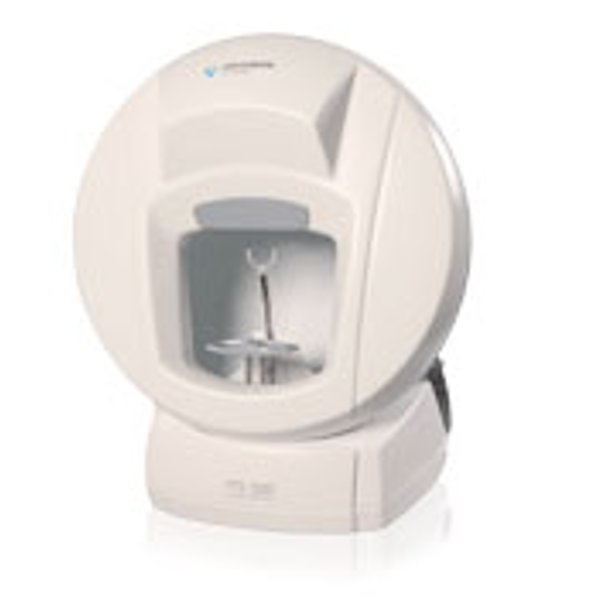 The closed type examination bowl provides a single solution for Goldmann kinetic and static perimetry and offers a wide range of strategies and analysis tools combined with an intuitive interface. 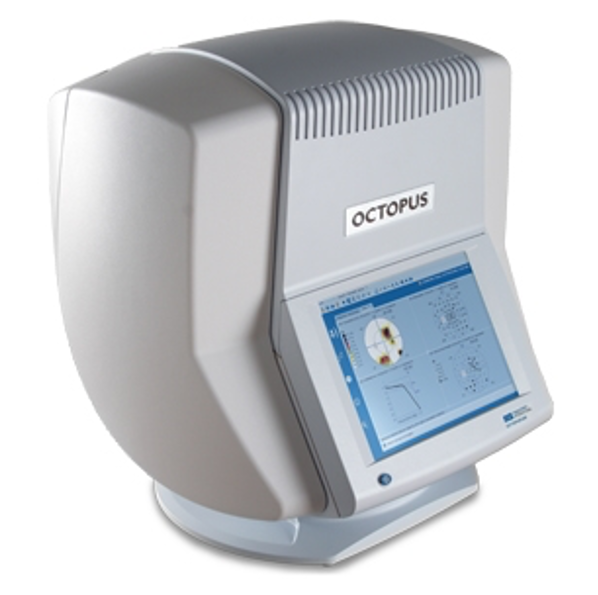 The Haag Streit Octopus 600 perimeter features new Pulsar early detection and standard white-on-white perimetry, with LED technology and touch screen. 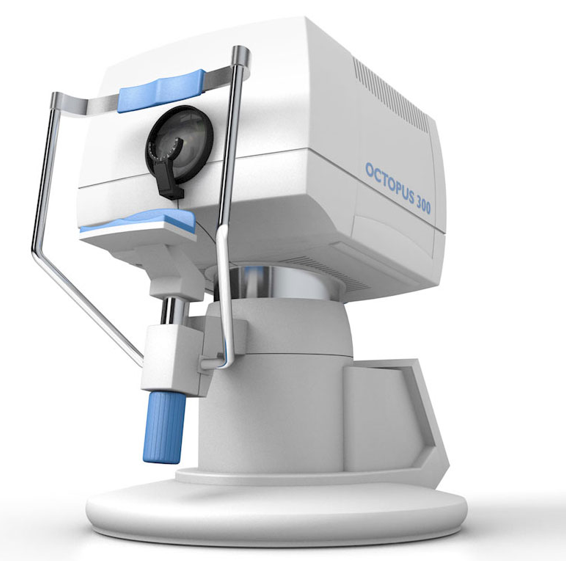 This instrument is compact sized with simplified perimetry to streamline operation and provide a range of visual field analyzing. While Veatch is a leading provider of perimeters, we also offer general maintenance and repair services—a huge long-term benefit to customers.